Sometime when we sit to meditate, our mind can feel like an untamed monkey hopping around from thought, to body sensations, to emotions. we can struggle with this untamed monkey for a long time, but if we cultivate a compassionate attention we can allow this jumping monkey to be just another sensation that can anchor our awareness to, that actually helps us stay connected to this moment. the monkey hops to either pleasurable things that we enjoy, so naturally we try to grasp on to it, to keep it. Or the monkey hops to things that we don't like and in this case we try to avoid it, push it away or numb it out. It will get more intense. Whichever happens doesn't matter. When we expand our practice to noticing whatever states arise and choosing to not react to them, we can make them part of our practice. Instead of wanting to reach out and grab the monkey to keep it, or push it away and avoid it, we simply witness what the mind is doing. A helpful way to witness this is through a practice called mental naming. Consciously name the experience as it arises as a way of acknowledging what is present, instead of getting hooked by the story line and carried out of the present moment. Begin by sitting comfortably, focusing awareness on you breath. As you feel each breath, simply name it as "in" "out" or "rising" "falling" say these words silently in the back of your mind. This mental naming gives your thinking mind a way to support awareness rather than wandering off. It helps connect you to the now experience. This is your life right here. This is what is happening when your not chasing or avoiding the monkey. This process of naming can be extended to all the experiences that might arise in your awareness. You can name body sensations that come up, such as "cold", "itch" or "cramp". You can name feelings, such as "bored", "restless" or "tired". You can name also use mental naming for the kinds of thought experiences that arise, such as "planning", "remembering" or "anticipating". When starting this practice first name the breath until a stronger experience arises that interrupts your attention. Then move your awareness to the stronger experience, feel it, name it, but don't label it good or bad. If judging comes up, name that "judging". Just be with whatever is most dominant in your now experience. One you name the experience, it will normally shift. Continue to name whatever is most prominent in each moment. When there is no dominant experience, return to naming the breath until the next strong experience arises. Stay simple, focus on one thing at a time. let the monkey mind be a tool instead of a nuisance. As a society we have developed habits in our breathing patterns and in our minds that stop of from connecting to the center of our heart. We tend to live more from our mind and our ego derived sense of self which causes a disconnect to the experience of life. When we live from our heart we steady into the "now" experience bringing us clarity, strength of mind, peace, and a deep connection. From this place we can learn honesty, compassion, and to love more deeply. With awareness to ones breath we can create space and openness in our heart so we can live more full from our center! Turn your awareness to the flow of your breath. As you inhale follow the breath as the upper lobes of the lunges fill, and the heart space expands. At this point in the breath there is a tendency to get up rooted from the earth...As you reach the top of your inhale notice if your eyes flicker upwards, this is a sign that you have temporarily lost your connection to the apana (downward flow of energy) and have momentarily become ungrounded. Continue by softly smiling at the end of the inhaling breath. Allow the pallet of the mouth to become luminous and keep the eyes soft and down cast. Just like a tree we must be rooted in order to blossom and open more fully. Now watch the out breath notice if the chest collapses in and the upper back rounds, work to maintain the openness of the heart as you feel the lungs softly peel. As if the lungs just finished gently kissing the inner ribs, instead of pushing the breath out. It's as if the peeling away allows a melting quality which keeps the center of the heart more fully open. Continue to follow the exhale and notice if you unconsciously contract the body at the end of the out breath. This squeezes and pushes us out of our heart. 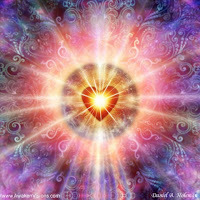 instead as you reach the end of the breath, keep the body soft with the heart radiating outward. Continue to practice in this way, allow the breath to bring you into the present moment while creating an environment where we may live and flourish from the center of our being. Maintain an inward smile, feel this smile tickle your brain bringing more compassion, kindness, and a sense of humor into our life. These natural breathing habits unconsciously push us out of our heart, for 2010 can we bring a conscious awareness to our breath so we my live more fully from our center. Do your habits serve your higher self? When we live our life every day, it's easy to fall into habits. Habits are actions that are repeated so frequently that they begin to happen almost unconsciously. It is important to pause every once in a while and examine these habits that have developed over time. Notice if these unconscious actions are serving you. Are they helping you show up for the world in a better way? Are they helping show up in your relationships in a more positive way? Are they making you a happier, healthy, more energized and dependable person? Yoga is a great way to help break these baits. In asana practice we can cultivate strength, courage, and determination. We can practice doing things on our mat that are uncomfortable, but still choose to do them because we know in the long run we will be a better person because of it. Can we decide on and off the mat to let go of old habits that are stopping us from showing up in the world, and in our relationships, in a more active positive way? One way to do this is by asking yourself "is this action I am about to take going to serve my higher self?"